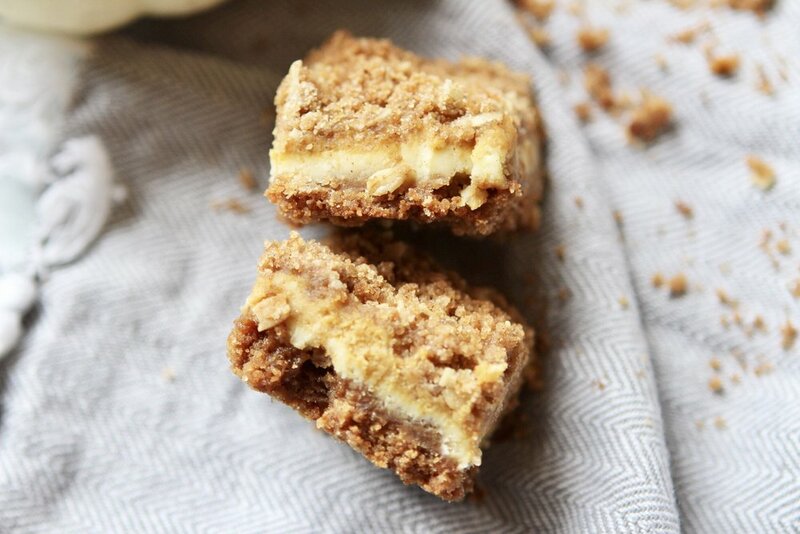 These cheesecake bars definitely take some time from start to finish but the end result is worth it! I made these for my husband's work Thanksgiving party and he told me that they were a big hit. 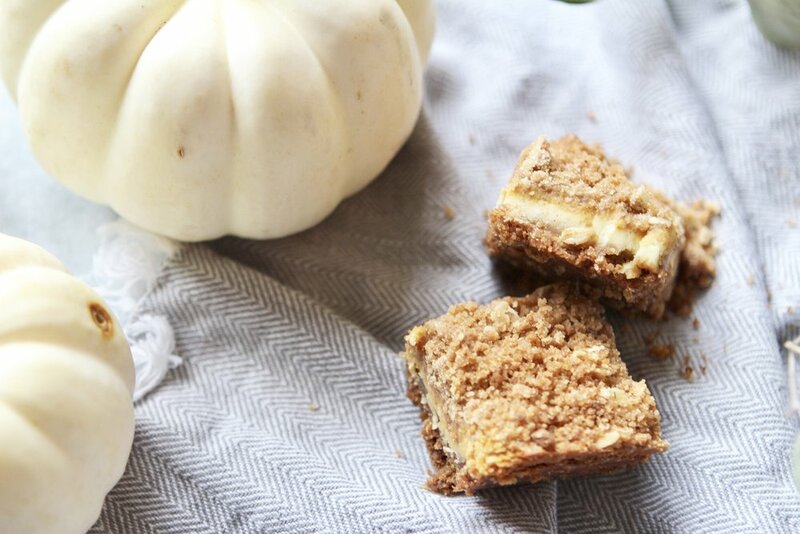 It's no wonder because they taste like little bites of fall deliciousness! Set out the cream cheese for an hour so that it reaches room temperature. Do NOT microwave it! Combine the crust ingredients and then press it into an 8x8 baking pan with a wooden spoon or your hands. Using an electric mixer on medium speed, combine the cream cheese, sugar and vanilla in a large mixing bowl. Beat until it is completely smooth and creamy (about 3 minutes). Add in the eggs, one at a time, and continue to beat for another minute. Pour half of the cheesecake mixture into the baking pan. Add the pumpkin, cinnamon and pumpkin spice to the remaining cheesecake mixture and beat until combined. Pour this pumpkin cheesecake layer on top of the plain cheesecake layer. Use the same bowl that you used to make the crust to make the streusel topping. Combine the brown sugar, flour, oats and cinnamon. Add in the butter and vanilla and stir until combined. Sprinkle this evenly over the cheesecake. Bake in the oven for 50-55 minutes or until the cheesecake has set. Allow it to cool completely (might take an hour or 2). Place in the fridge overnight. Cut into bars and serve!